The 73:40 minute full-length album 'Reflections From The Future' (Erinnerungen an die Zukunft) is an enthralling journey through space. The trancelike and transfigured ambient parts are diversified by the melodic driven pulsating arrangements. This 'cygnotic blend' keeps the tracks fresh, organic and alive. Blubbering Moogs, pulsating sequencerlines and brizzling space sceneries meet with tribal grooves, overtoned synthleads and deep moody pads crossing the fields of ambient, psychedelic, trance, classical synthesizers, berlin school and even dark wave in an unheard unique electronic fusion...just cygnotic. 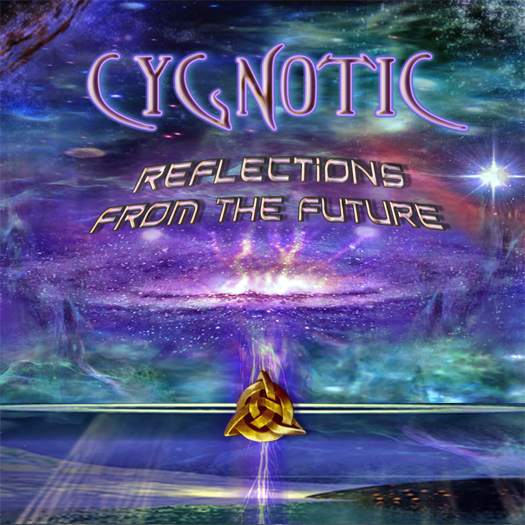 Cygnotic might bring up images to the listeners mind, telling stories through sound. In 'Reflections From the Future' you will travel through space, pass nearby black holes, experience the harmonics of a universe of sound. Furthermore this is also done directly within the sound enhanced narrative 'Transmediale Protokolle' (excerpt by courtesy of Amadeus Verlag, Germany), an extract read of Jan van Helsing's book 'Unternehmen Aldebaran', leading out as a kind of epilogue from the previous uptempo track 'Jenseitsflugmaschine', describing the flight of a saucer through a wormhole to Aldebaran. Enthusiasts of synthetic aroused sounds will certainly detect musical influences of electronic old-school masters like Jean-Michel Jarre, Tangerine Dream, Klaus Schulze and Kraftwerk as well from contemporary electronics like VNV Nation that are proudly visible without ever losing its own ‘cygnotic' identity and character. Furthermore Cygnotic fills the gap between traditional electronic arrangements and progressed electronic listening without sounding dated. A passage through the last four decades of electronic sequenced music resulting in the next sublime dimension of gripping melodic electronic music where time melts away in a state of euphoric melancholy.